DeWitt Clinton High School in Bronx: Grade-fixing scandal shows stakes of high scores. 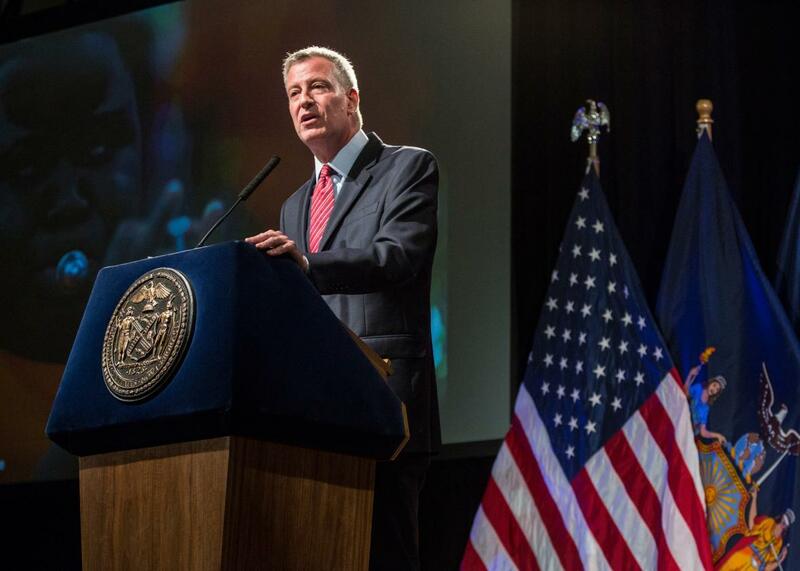 New York City Mayor Bill de Blasio outlines his vision for New York City schools at Bronx Latin School on Sept. 16, 2015. Another Bronx School, DeWitt Clinton High School, was part of the mayor’s Renewal Schools program for the city’s lowest-performing schools. In one case, Santiago Taveras gave a senior who received a “no show” in a global-history class a 75 and changed her failing 55 grade in gym to a minimum passing 65, records show. She then got a credit for each class, which she didn’t deserve, several staffers charged. … Taveras changed a student’s failing 55 grade in an English class to 90. … For another student, a failing 55 in algebra for a summer class in 2014 was changed to 65. In a departure from protocol, the principal signed the grade forms, according to the Post (which in a different story also reported that Taveras installed a shower for himself—as in, both for his personal use and with his own hands—inside the school). Taveras is in his third year at the helm of DeWitt Clinton High School, a large, century-old comprehensive school that was part of Bill de Blasio’s “Renewal Schools” program, which is pouring additional resources into 94 of the city’s lowest-performing schools. The school had another year to show “demonstrable improvement” or potentially meet the fate of so many other New York City schools under de Blasio’s predecessor, Mike Bloomberg: closure and/or takeover. This long and laudatory New York Times profile of Taveras, published almost exactly a year ago, details the massive challenges of turning around a school like Clinton. The school—which currently serves about 2,100 students, down from a high of 5,000, and has a graduation rate of about 45 percent—used to be one of the city’s great high schools, boasting a roster of illustrious alums that includes James Baldwin, Neil Simon (who graduated at 16), and Ralph Lauren (né Lifshitz). [A]s hundreds of small schools opened, principals and teachers at the remaining large schools like Clinton often complained — and statistics often corroborated — that they were getting disproportionately high numbers of the most challenging students. In his fight for Clinton to show such “demonstrable improvement,” Taveras had been pushing teachers to adopt more lenient grading policies. In an email from last December, he reminded teachers, “Our goal is to have a pass rate of 80 percent for the year,” even if that meant letting failing kids boost their grades with extra-credit assignments. Or, worst-case scenario, boosting those grades himself with an eraser and some creative arithmetic.